The storm is over. Everything is back to normal - for us. We lost our cable, phone, and internet for about 36 hours and that was it. When the cable came back on, we were finally able to witness the devastation that took place throughout Connecticut and all along the coast. My family and I realize how very,very lucky we are. I have spent the last two days prepping for Irene. I hope I am ready. Actually, I hope that all this preparation was for nothing! I've cleared everything off of my deck. It looks so sad without all of my geraniums! I have ice ball balloons in my freezer. A tip from my brother who has been through a few hurricanes. The kitties have a food supply. I can only hope this is enough water. Jonas and Momma are looking as cute as ever! Let's hope the storm doesn't scare them! I packed up my Queen Anne kit-just in case I have to grab it quickly. Of course, I baked! Oatmeal chocolate chunk cookies to keep everyone happy. Last and most important- a cooler full of beer! I finished my fairy finally! (That sounds like a tongue twister...) She's a little shy and definitely sweet. I'm going to call her "My Little Dreamer" until she decides to tell me her name. Baking is a form of therapy for me. If I am feeling a little stressed, I usually head to the kitchen and whip something yummy up. This is a win win situation for my family. I'm calm, and they get good eats. This summer the weather has been so warm that not a lot of masterpieces have come out of my oven. No baking means no release of pressure inside my head!! Yesterday, I could feel my blood pressure rising, bubbling to the point of explosion, so I pulled out the Kitchen Aid, kicked the air conditioning on high, and baked up some Black & White cookies, one of my all time favorites! The family was thrilled, and it seems our cat, Jonas, was ecstatic! Jonas thinking about the cookies. Jonas critiquing the cookies; I think he likes them! The verdict is in: if Jonas likes the cookies, then everyone will like them!! Preheat oven to 350 degrees F. Cover cookie sheets with parchment paper. Stir together flour, salt, and baking soda in a medium size bowl. On a medium speed in a larger bowl, beat sugar, butter, and shortening for 2 minutes until fluffy. Continuing beating while adding eggs, vanilla, corn syrup, and lemon extract until evenly mixed. Add half of the flour mixture, beating until evenly mixed. Switch to low speed, and mix in sour cream. Add the other half of the flour mixture; beat until nice and smooth. Let the dough rest for 5 minutes so it can firm up a bit. Use your hands (grease them with a little butter) or use a larger ice cream scoop to shape about 1/4 cup of dough into balls. Put the balls onto the parchment lined cookie sheets, spaced about 4 inches apart, and flatten to about 3 inch disks. Try to keep the tops smooth; I use my palms. Bake for 12 to 14 minutes in the oven on the middle rack. Half way through the baking process, rotate your cookie sheet to be sure of even browning. Cookies are done when the tops spring up when touched in the middle and the edges are golden brown. Remove cookie sheet from oven, let rest on wire rack for 1 minute, and transfer the cookies to another wire rack to cool completely. Bring water and corn syrup to a boil over med-high heat in a medium saucepan. Remove from the heat; whisk in the powdered sugar a cup at a time until smooth. Whisk in vanilla. Be sure that the fondant is really smooth. In a small bowl, place chopped chocolate and pour 2/3 cup of the white fondant into the chocolate, stirring until chocolate is almost melted. Add another 1/2 cup of the white fondant over the chocolate. Stir, adding 3 to 4 teasppons of hot water, until the chocolate fondant is smooth and liquidy but not runny. Put wax paper under the wire racks where your cooled cookies are resting. (At this point, I like to take a little of the chocolate fondant and put it into a pastry bag ritted with a small tip. 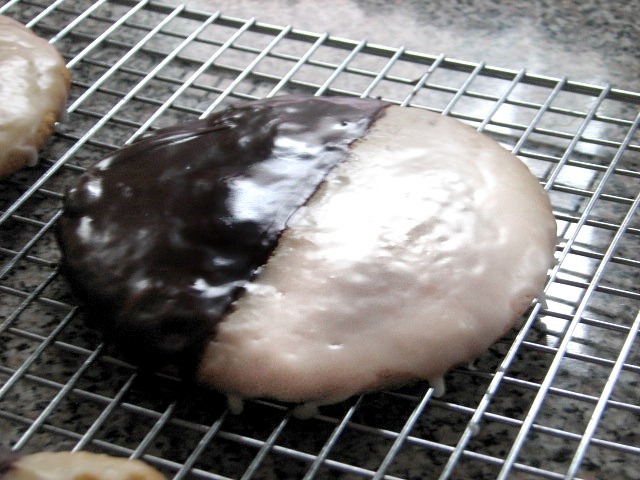 I make a chocolate line down the middle of each cookie. You don't have to do this but I find it makes the frosting process neater.) Spread one half of each cookie with chocolate fondant. I like to use the back of a spoon to do this. Cover the half completely. If you find that the fondant is too thick, you can add a few drops of water to help thin it out. Stir the white fondant. If needed, add powder sugar if too thin, or hot water if too thick until you get a nice spreadable fondant. Spread the other half of your cookies. Be sure to let the cookies rest on the racks for at least 2 hours until the fondant sets. I store the cookies in between wax paper overnight in an airtight container so the flavors mesh together. You can keep them stored this way for a week (or they can be kept in the freezer for a month). However, I like to package each cookie individually; I think it makes eating the cookie more exciting. I can't help it; I'm goofy like that. These cookies may seem like a lot of work but they are so worth it. Just ask Jonas!